What will Orient look like in 25 years? 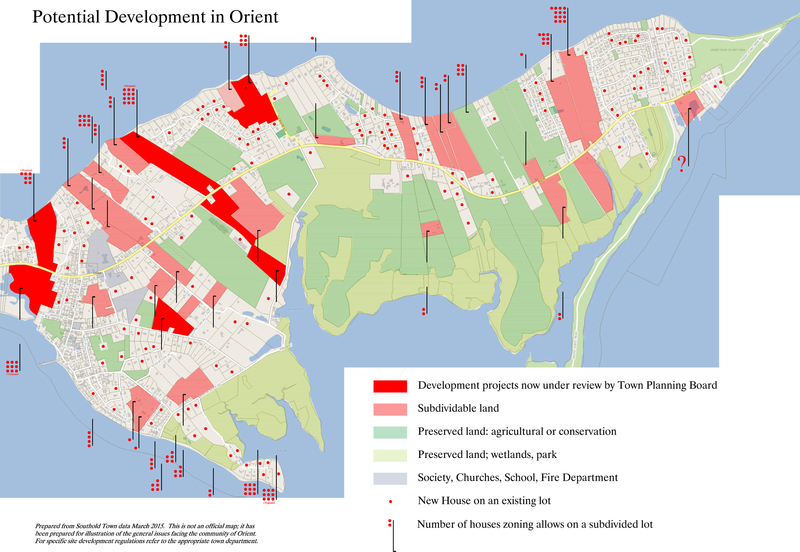 As Southold Town finalizes its long-awaited comprehensive plan, Orient residents have nearly completed a land use policy of their own. Southold Town will unveil interactive maps online that detail current zoning, one of the ideas discussed at last Thursday’s informational meeting at Town Hall. The maps are expected to be available in about two months, according to planning director Heather Lanza. Over 20 people attended the meeting to discuss Southold hamlet’s zoning and land use as part of the Southold Town Comprehensive Plan. The latest segment of the Town of Southold’s Comprehensive Plan is now available to the public. The final draft of the Natural Hazards chapter focuses on planning for events such as coastal flooding, damaging storms including nor’easters and hurricanes, and sea level rise. This is the ninth chapter of twelve to be completed so far. There will be a series of public hearings on the draft plan after all the chapters are completed in 2014. The town is currently accepting additional input on all the chapters via email. FILE PHOTO | Orient State Park was heavily flooded post-Sandy. The Southold Town Board presented the natural hazards chapter of the town’s comprehensive plan Wednesday during its annual visit to Fishers Island. The 10th chapter deals with disaster and emergency response and could potentially results in changes to the town’s building and wetlands code. While other chapters of the comprehensive plan do not call for changes to town policy, this section would likely result in modifications to existing building and wetland codes, planning director Heather Lanza said. A coastal resilience plan, which would include revisiting the town’s code on elevation of structures in a floodplain and stabilizing vulnerable bluffs, would be implemented to prevent coastal erosion and damage to the town’s infrastructure. The town currently relies on hazard mitigation guidelines provided by the county, a system Ms. Lanza called “pretty good.” The proposed costal resilience plan would be an extension of that guide and would include mitigation measures for extreme temperatures and a rising sea level, Ms. Lanza said. Reports predict sea levels to rise enough to permanently flood the lowest-lying areas in Southold over the next several decades, according to the planning board. The section also deals with developing a post-disaster relief plan. “The town doesn’t have a long-term plan for disaster recovery,” Ms. Lanza said. The planning board recommends the town consider creating a recovery and reconstruction ordinance in the town code. The ordinance would create temporary regulations for dealing with debris abatement, handling non-conforming uses and even permit fee waivers, Ms. Lanza said. The new chapter also encourages the formation of a recovery management organization that would last into the long-term recovery phase and help direct the preparation and implementation of a reconstruction plan. The members would include representatives of the town’s building department, public works department, accounting office, highway department, planning department and engineers, according to the draft document. Before the final draft is complete, Ms. Lanza said the planning board would take additional comments in the form of letters or email from the public on the chapter. TROY GUSTAVSON FILE PHOTO | The town’s natural hazard plan will deal in part with post-disaster relief. Rabbit Lane in East Marion (above) was among the streets hit hardest by Hurricane Sandy. The Southold Town Board is hosting a public meeting on the natural hazards chapter of its comprehensive plan today, Tuesday. The section deals with natural hazards and a suggested action plan for disaster and emergency response. It also includes numerous goals including designating shelters, developing a post-disaster relief plan and hazard mitigation. The town currently relies on hazard mitigation guidelines provided by the county, a system planning director Heather Lanza called “pretty good.” The chapter will update the county’s plan, she said. It will also address problems associated with climate change, such as rising sea level and heat waves, according to town planning director Heather Lanza. The meeting will be held at 10 a.m. at the Peconic Community Center on Peconic Lane. A final meeting on the chapter will be held Wednesday at 11:30 a.m. at the Fishers Island Community Center. Southold’s programs for seniors, youth and people in need are in the spotlight in this month’s installment of the town’s draft comprehensive plan. The draft Human Services chapter, released July 17, paints a picture of increasing needs for services for town residents at the same time that funding for these programs is dwindling. The chapter also calls for the town to produce more bilingual materials in response to the 142.6 percent increase in the Hispanic population in town between the 2000 census and the 2010 census. Financial hardships are also on the rise, with median household incomes decreasing in Cutchogue, Greenport, Laurel, Mattituck and Southold, and an increase county-wide in requests for food stamps of 168 percent in the past four years. The report also notes that domestic violence, which is exacerbated by substance abuse and economic hardships, is on the rise on the East End, at a time when federal child care subsidies are being cut. Town Special Projects Coordinator Phillip Beltz presented the findings of the chapter at a public forum at the Peconic Lane Community Center Tuesday night, as an impending thunderstorm kept all but two community members from attending. A second meeting is scheduled at the town’s Human Resource Center on Pacific Street in Mattituck at 2 p.m. today. Mr. Beltz said the authors of the chapter would like to see the town host a monthly job bank with local employers seeking employees, and provide continued employment opportunities for financially disadvantaged youth through the town’s “summer works” program. They would also like to rekindle the town’s relationship with the Suffolk County Department of Labor, which briefly opened a satellite office at the Human Resource Center in Mattituck in 2010. The chapter also calls for the renaming of the Human Resource Center, which has come under criticism from people who believe it sounds like it should be the name of the town’s employment office, not the town’s senior center. The chapter also calls for more intergenerational programming, allowing young people and seniors to work together on projects and assist each other. Mr. Beltz said that lack of public transportation was a major issue, particularly for young people who want to be involved in town programs. He and Human Services Director Karen MacLaughlin suggest repurposing some of the town’s aging fleet vehicles to be used for youth programs. Mr. Beltz said the town is also working on a community service day this fall, when people who are interested in volunteering can talk to representatives from volunteer organizations about what they can do to help. Read more from Tuesday’s meeting, including reaction from the public, in Thursday’s paper.